Today is dad’s birthday. He is 83 years old. Yesterday was his wedding anniversary. Mom and dad have been married 60 years. I went to spend the day with dad yesterday and Kathy went today. We try to spread out our visits, as to keep the confusion to a minimum. I had decided that I would take dad and spend the day with him doing something fun and give mom the day to herself to relax. She is always saying that she needs some time to herself. So, when I arrived yesterday at 11:00, we visited for a little while and then I took dad with me into Washington to get some lunch. I had made mom some homeade chicken salad for lunch, so I knew that she was settled in for the afternoon. Dad and I went to Down on Main for lunch. Thursday is their shrimp special lunch and dad loves shrimp. We had a nice relaxed meal sitting out front at a little cafe table. After lunch we drove around the block to the Estuarium. It is a wonderful interactive museum preserving the history of the river and the area. Dad loves history and he had a great time looking at the exhibits. There were only a few people in there, so again, he was under no pressure to interact with people. This seems to make him nervous now. I had signed us up to take the River Tour and around 1:15, they asked us to gather for the tour. Gathering with the small group of people confused dad and he turned to me and told me that we had lost mom and we needed to find her before we could leave. I told him that we had left mom at home because she wouldn’t enjoy the river ride. He was okay then and we boarded the pontoon boat. 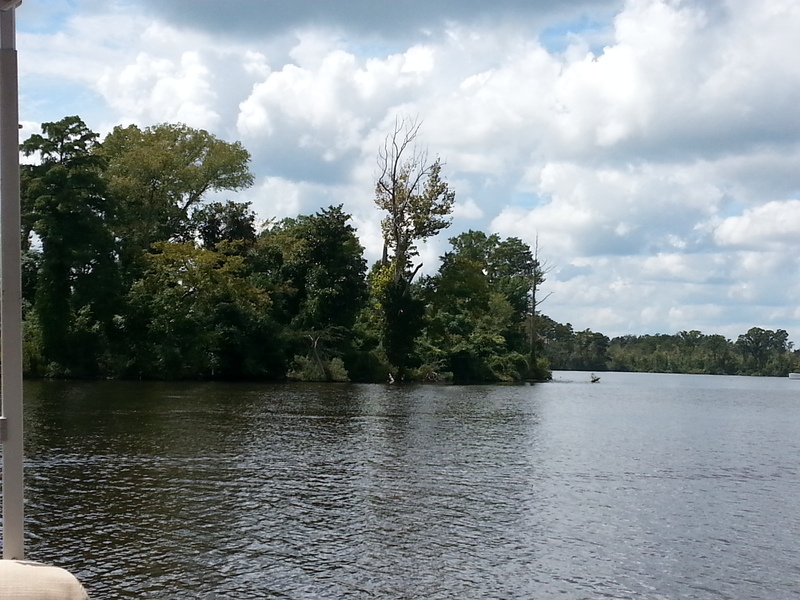 We spent about 1 1/2 hours cruising down the river, frequently stopping to hear about some of the history or to see different species of cypress trees or other plant life. Our tour guide was very knowledgeable and dad appeared to be having a wonderful time. We discussed some of what we had seen and learned on the way home, but I never know how long an experience will remain with him before it is lost forever. When we got home, dad told mom that we had gone almost to Greenville and around Chocowinity and then down the river. Mom, being mom, told him that he had already been on the boat before, so it wasn’t anything new. That didn’t deter him, he told her about the great time that he had. Today Kathy and Jonas went to spend a couple of hours with mom and dad for his birthday. Kathy told me that dad told them about his river tour yesterday and what fun he had. Later this afternoon I called to tell him Happy Birthday officially today. Mom said that he had told everyone about his river tour and what he had learned about the history of the area. I am so happy that I was able to share that with him. And then the bittersweet part of the story. When dad got on the phone so that I could tell him happy birthday, he told me about the wonderful time that he had on the river yesterday. He then proceeded to describe what he had seen and what he had learned. He remembered everything that the guide had told him but he didn’t remember that I had gone with him. I am grateful for the memories that he does have and we will continue to try and help him create new ones, even if they do not stay with him long, I believe that they help his well being and I will always believe that. This entry was posted in Uncategorized and tagged Aging, Alzheimer's, Dementia, Elderly, Memories on September 6, 2014 by debbiewaitleybroker.